Texture and color-play combine to form a cozy wrap for summer evenings. 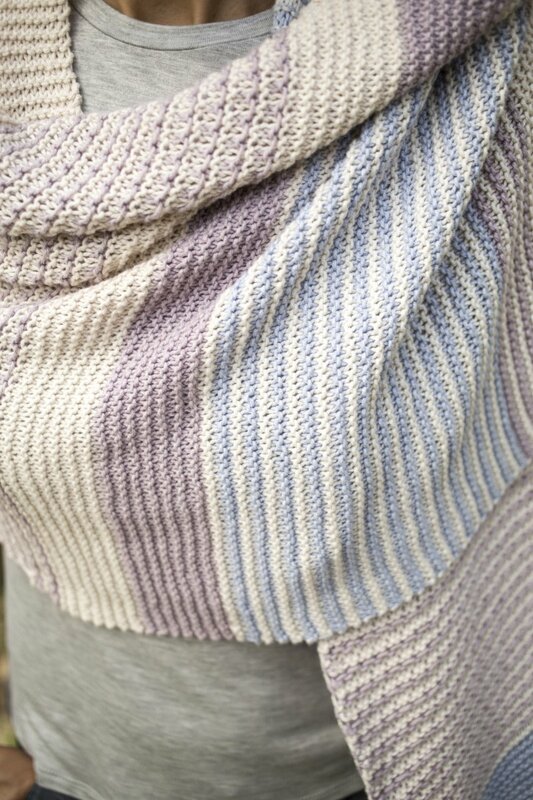 Garter stitch, check patterns, and stripes are used in this stole knitting pattern. Berroco Booklet 370 Corsica Patterns - Roberts - PDF DOWNLOAD is a similar pattern: 18 (4.5 sts. / inch) finished gauge, shawls, wraps, ponchos garment, for women, sport (24-26 sts/4 in) yarn gauge, and berroco corsica suggested yarn. You may also like Berroco Booklet 393 Millefiori Light Patterns - Jardin - PDF DOWNLOAD, which is another similar pattern: shawls, wraps, ponchos garment, for women, sport (24-26 sts/4 in) yarn gauge, and on size straight needles, size 6 (4.00 mm) US needles. You may enjoy taking a look at the , and Berroco Corsica Zita Shawl kits all using Berroco Booklet 388 Corsica Patterns. Hopefully our suggested yarn options for Zita - PDF DOWNLOAD can help you come up with your next exciting new project idea!